I think I’ve mentioned before that my husband is originally from Minnesota and while he’s left home, the majority of his family still remains in Minnesota. We try and see see his family once a year, whether that be his family coming out to California to visit us, or us going to Minnesota to visit them. In 2016, my husband decided it was time for us to fly to Minnesota to visit his family. This was going to be a quick, long weekend stop to the Land of 10,000 Lakes where we’d catch up with my husband’s parents, his sister and her husband, and even his aunt, uncle and cousins. After flying in from LA and arriving in the early morning hours of the day Central time, we had just enough time to lay our heads down in a hotel room for a couple of hours before being picked up for breakfast the next day. My husband’s aunt and uncle were preparing to head out of town on the day we arrived into town and we figured that the only possible way we’d be able to meet up with them would be if we could catch up over a hearty breakfast. My husband’s aunt, who was born and raised in Saint Paul, and still lives in the suburbs, decided to take us out for breakfast at a classic Saint Paul institution nearby the University of Minnesota campus. This particular restaurant was chosen as it’s one that my husband’s aunt, who grew up in Saint Paul remembers going to while she was in her college years. 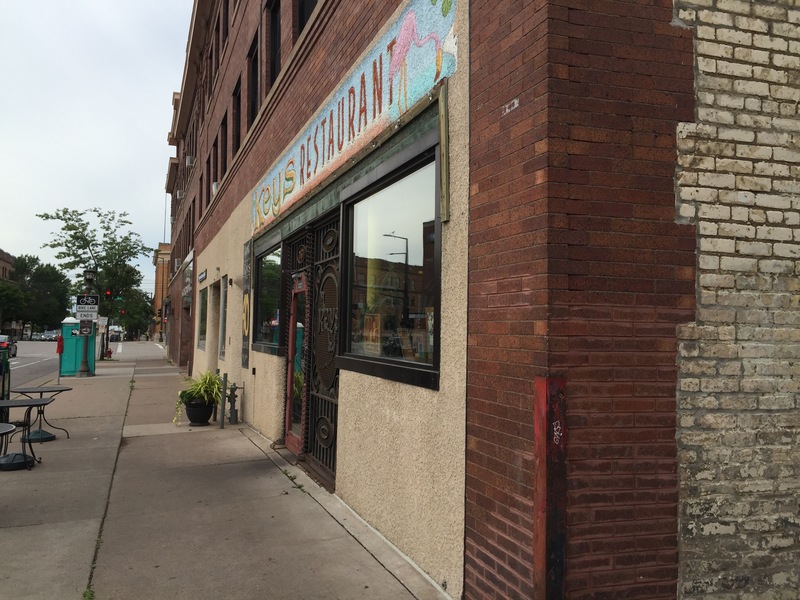 Keys Restaurant opened its doors in this particular location in Saint Paul back in 1973 by Barbara Hunn who owned, operated and perfected the restaurant’s famous made-from-scratch recipes for breakfast, lunch dinner, and of course dessert. 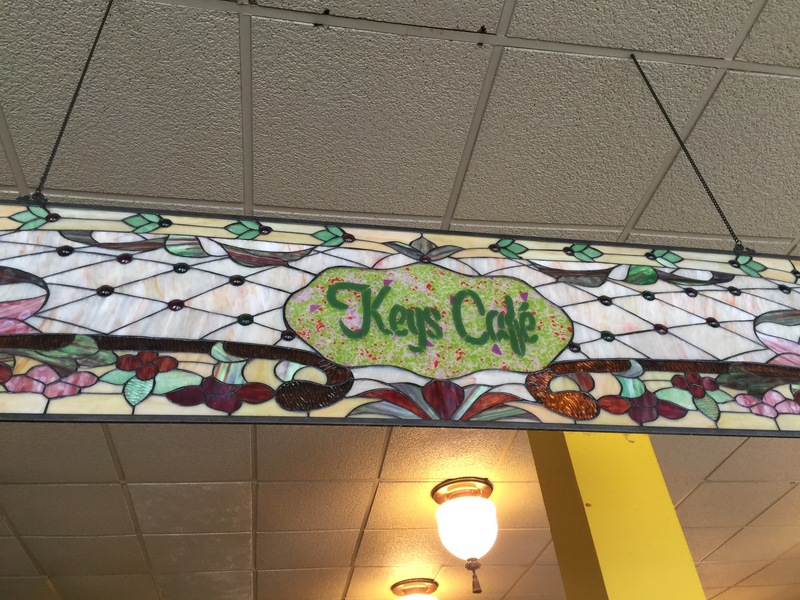 Ten years later, the second Keys Cafe & Bakery opened and has now expanded to included 9 different restaurants and cafes through Minnesota and Wisconsin. The interior decor was like walking into an old mom & pop cafe. There was an old fashioned cash register right at the front of the restaurant, there was a bar seating along one side of the restaurant, much as you’d find in an old diner set up, and then the rest of the dining room opened up to large scarred wooden tables, almost all of which were filled with groups of people there to enjoy a nice hearty morning breakfast. My husband surprised me and ordered the Key’s complete veggie scrambler served with a side of toast and homemade jam. Now, neither my husband and I are vegetarians and we both enjoy our meat, so I was surprised that my husband chose an all-vegetable dish. 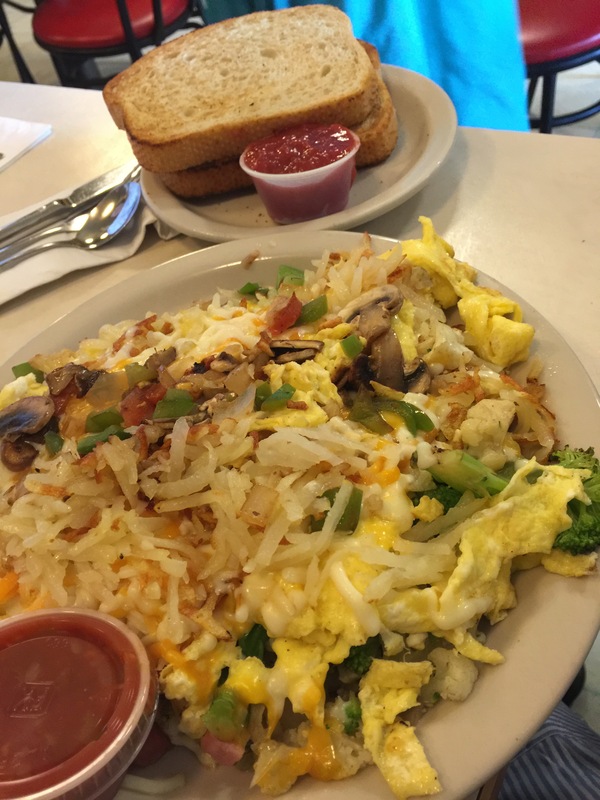 The veggie scrambler comes with eggs scrambled in mixed vegetables and topped with hash browns and cheese. It’s like a complete breakfast, minus the meat, all rolled into one dish. The veggies included mushrooms, broccoli, and red and green peppers. First off, the plate was huge! This literally could have been breakfast for 4 people rather than for 1 person. But the dish was tasty and hearty. My husband really enjoyed the scrambler, even minus the meat. All the veggies were well cooked and had great flavor and the addition of the hash browns and the cheese topping it all off were the key to making the meal incredibly hearty, a stick-to-your-ribs kind of breakfast. Surprisingly, regardless of the fact that the plate was huge, my husband actually finished his meal! What more could you want out of breakfast? I needed some meat with my breakfast so I decided to do the create your own omelet, which said it came with two eggs. In reality, it seemed more like it was about 10 eggs rather than two. 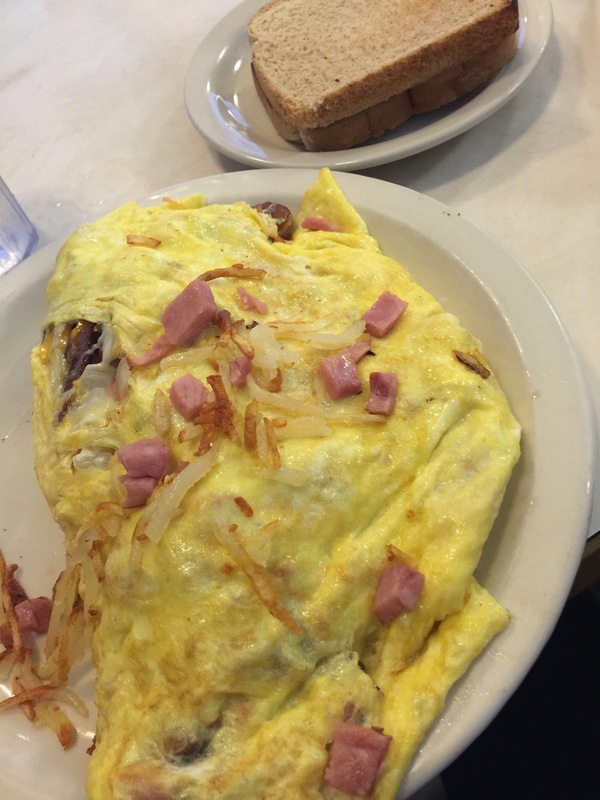 I chose as a filling for my omelets cheese, ham, onion, bacon and potatoes. Again, talk about hearty. This omelet was about the size of my head, and the filling was literally that, filling. The eggs were cooked, and then more like French omelet style, the filling was put into the middle of the egg and the eggs were wrapped around it. And when they said bacon, they literally meant there were strips of bacon in the omelet, these weren’t bacon bits or pieces that were chopped up and mixed in with the eggs, no, they were full on strips of bacon. And potatoes? It wasn’t just diced potatoes put into the omelet, the hash browns that my husband had piled on top of his scrambler? Well, I had those same hash browns stuffed inside my omelet. Then there was still the cheese and the ham, big huge pieces of diced ham, and then finally the onions. The omelet was delicious and very well done, just the way I like it. But the filling was overflowing and was more than a meal on its own that there was going to be no way that I was ever going to finish this omelet. Though, I too must have been quite hungry, as I finished over half of it, which was at least 25% more than I thought I would. The great thing about having a filling breakfast to start the day was that my husband and I weren’t hungry for lunch at all. Instead, we were still quite full from our amazing breakfast from Keys Restaurant. It was so great to spend some time with my husband’s aunt and uncle and just catch up with them over a great meal. And at the same time, we got to experience a little Saint Paul food history. After all, for a restaurant to still be around more than 40 years after it opened its doors, well it must be doing something right that people keep coming back over and over again. I’ll just remember that if I ever find myself at a Keys Restaurant or Cafe again that I should share a meal rather than try to finish a meal on my own as their portion sizes are out of this world.